Hola! 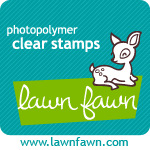 We're getting closer to the release date of the July collection of stamps from Dulces Ideas Clear Stamps. Tomorrow (July 1st) all 5 sets will go on sale! Today, I'd like to show you a card made with the set called Decoracion. This 4x6 inch set add all the finishing touches for creating a perfect nursery. Paloma designed stamps for windows and curtains and masculine and feminine items you would find in any baby's room. Decoracion will sell for $10.99 plus shipping. Using the window stamp, I added an actual window on my card. I added a square of acetate as the "glass". You can get a tiny glimpse inside this feminine nursery. You can't really see in the photo, but I used the flower stems to stamp grass on the green paper. The sentiments are from the Ya Nacio' stamp set. 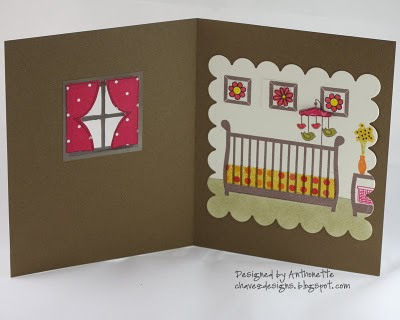 When you look inside, I used stamps from Cuarto del Bebe and stamps from Decoracion to complete the nursery. 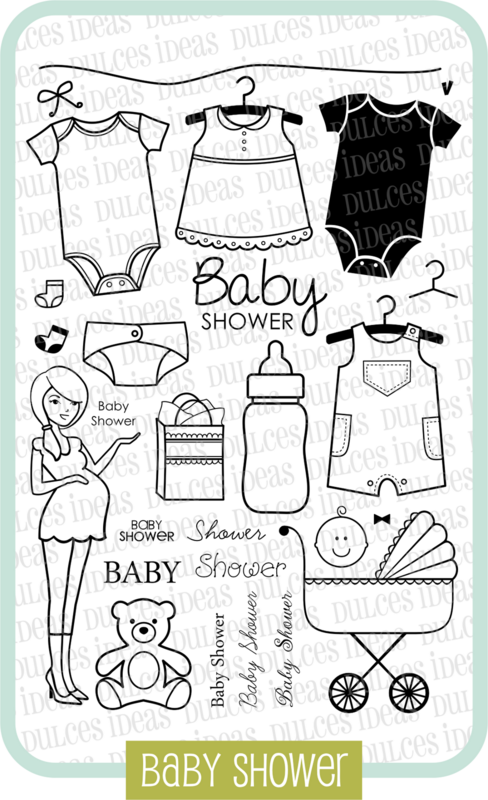 Today I'm showing you the second set of baby-related stamps from Dulces Ideas Clear Stamps. This new set is called Cuarto del Bebe. This 4x6 inch set of stamps has all the furniture you would need for a nursery. Starting on July 1st, it will sell for $10.99, plus shipping. Paloma has outdone herself this month with this release! 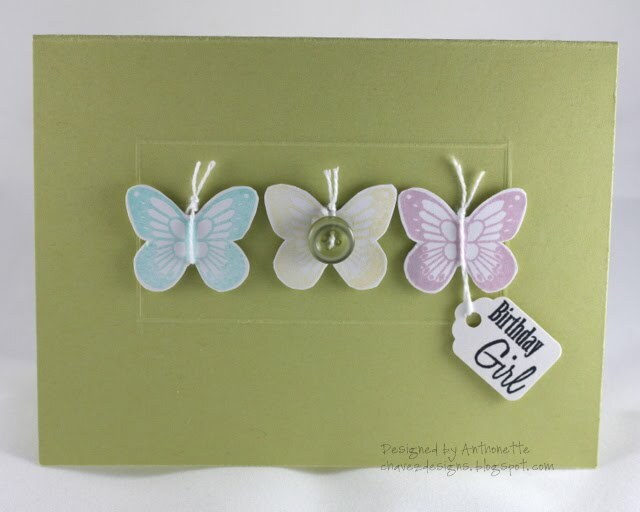 My card uses the chair stamp from the set to create a feminine card for a baby girl. 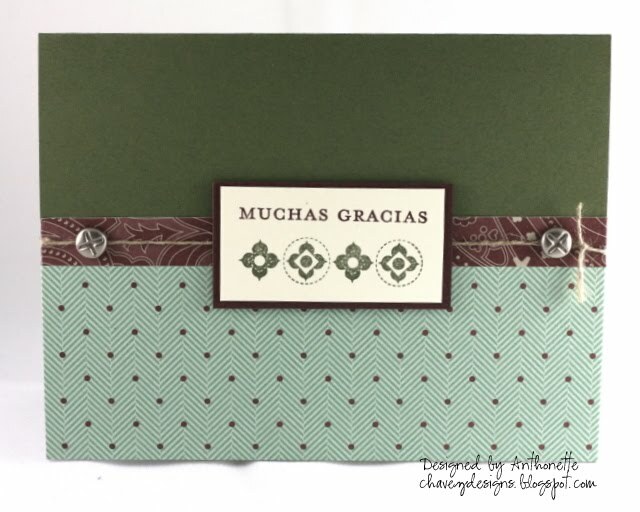 I used the tiny stamps from Decoracion (a set we will reveal tomorrow) to create the background. The sentiment comes from the Welcome set. 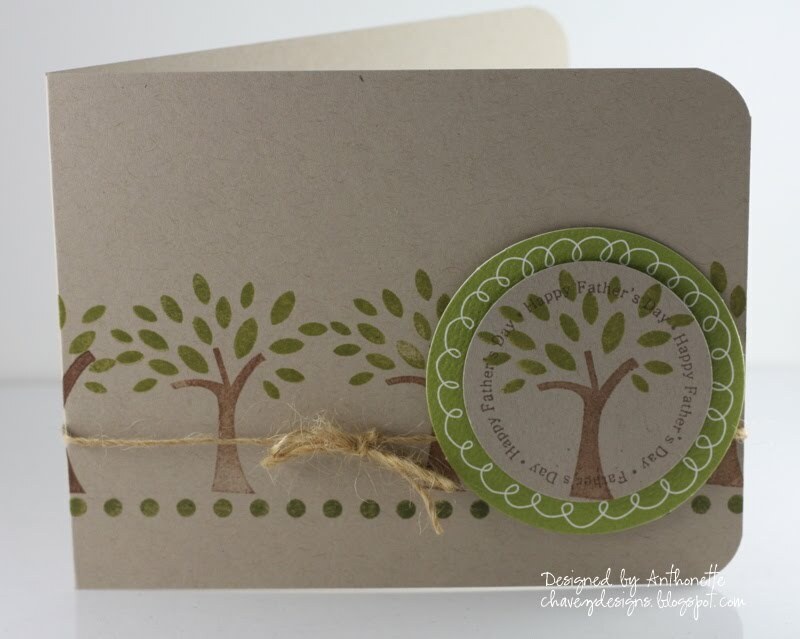 Welcome is a 4x3 inch stamp set that will sell for $5.99 (shipping will be free if you also buy a 4x6 inch set). I was drawn to the chair stamp because my father-in-law made a chair with this exact design for the nursery before Kalino was born. The only difference is our chair is a rocking chair in masculine colors. We read with Kalino every night while sitting in the chair. He treasures this time with each of us and gets very upset if we try to skip reading (even for one night). The kid loves his storytime! The crib in this stamp set is how I first noticed Paloma last November. She created the most amazing card for Dawn McVey's color challenge. Check it out here! 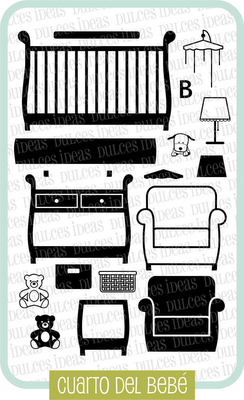 Paloma also sells an SVG version of this crib here so you can cut it with your Cricut digital cutter. Sweet, right? This is my second card today showing the new Baby Shower set from Dulces Ideas Clear Stamps and a preview of other sets releasing this week (Ya Nacio' and Decoracion). See the details on my previous blog entry. This card is clean and simple; my favorite style. I used the small images to create a masculine background with VersaMark ink. The baby bottle has a tiny bit of paper piecing. I actually sewed the buttons onto the felt and then wrapped the linen thead around each button. Hi everyone! 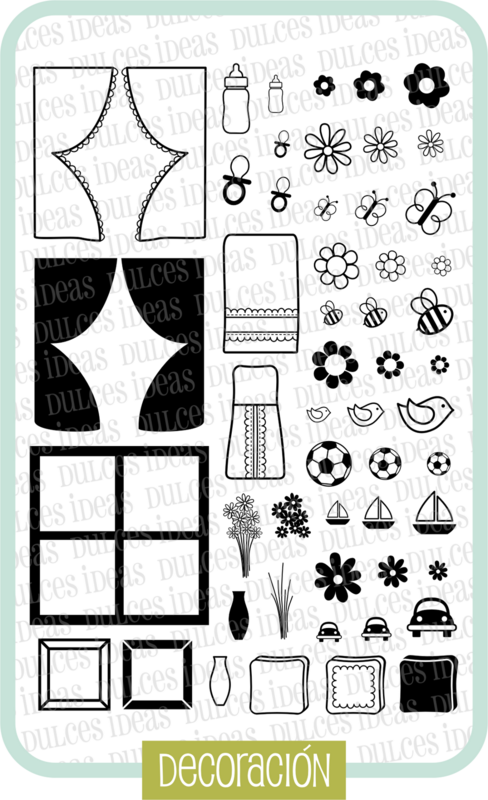 Today we are starting to show you the July Collection from Dulces Ideas Clear Stamps. 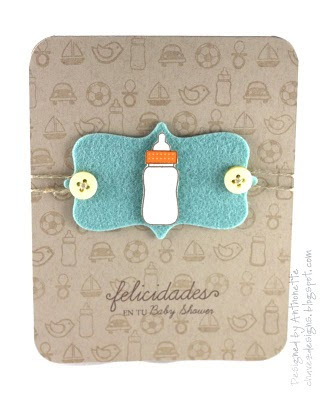 Paloma's new designs are all about babies! There will be 5 stamp sets this month (3 are 4x6 inches and 2 are 4x3 inches). Too bad I don't know personally know anyone expecting a little one, because her new designs are awesome! I had trouble figuring out what image to use first. 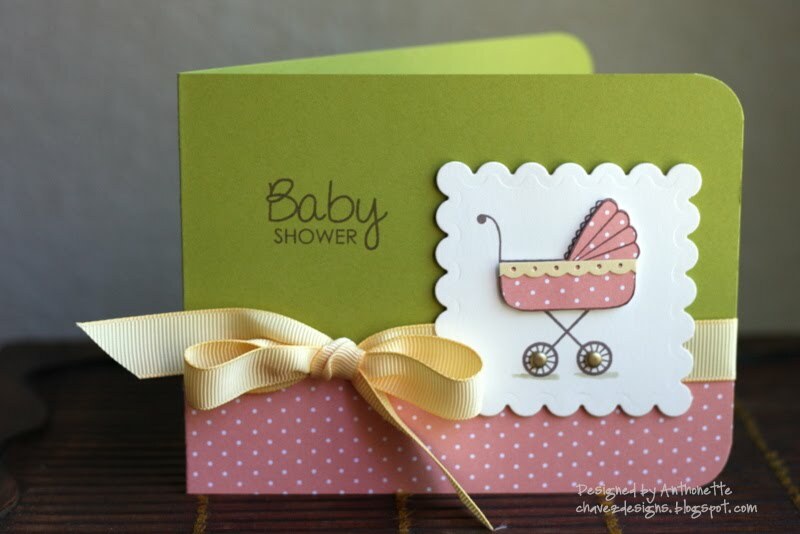 This first card uses the baby carriage (or pram) stamp from the new set call Baby Shower. This stamp set is 4x6 inches and will sell for $10.99, plus shipping. The small stamp sets will sell for $5.99. 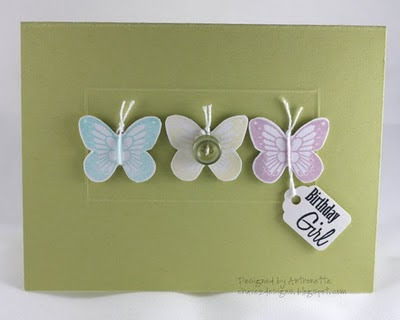 I used the colors from the latest Embellish Magazine challenge (which is a about babies too) as my guide for creating this card. Here I am late again at these challenges. Sigh! 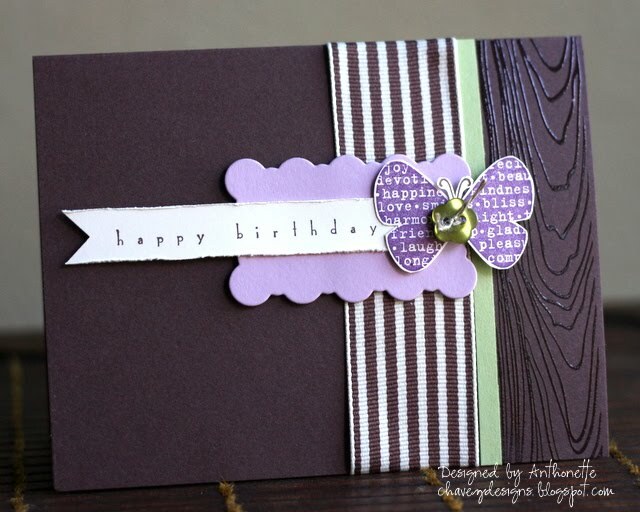 This layout is based on a cute card from a Stampin' Up mini catalog earlier this year. My photo doesn't really capture the lemon tart butterfly. Thanks for stopping by. I'm barely on time with this one. Kristina's deadline is in less than 5 minutes! Ack. 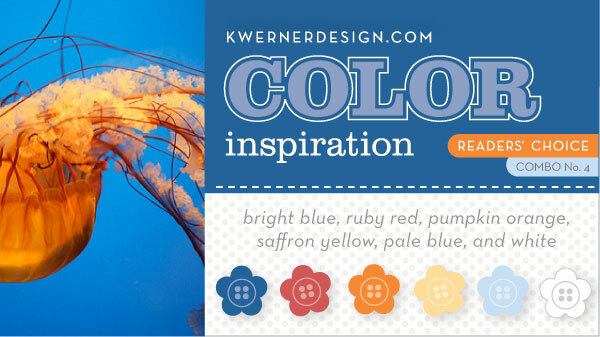 Here's my card for the Kristina's Reader's Choice Color Inspiration No. 4. 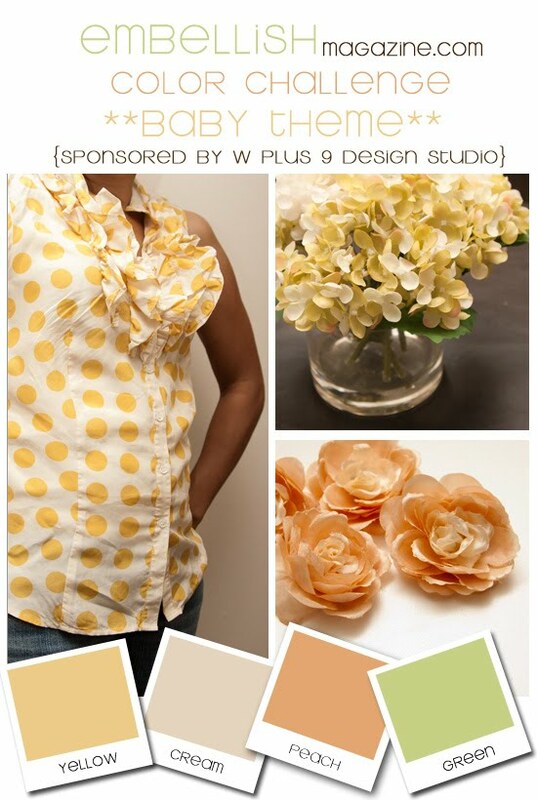 The colors this week are from a great bright and colorful photo. I remember voting on this particular image. I love jelly fish! I didn't want to shy away from the bright colors. I designed about 4 versions of this card and I kept coming back to the photo. The bright blue and pumpkin pie orange had to be dominate in my design. So, I went with it. The SU! butterfly stamps were a great surprise gift from Makeesha Byl who lives in Australia. Thanks, Keesh! 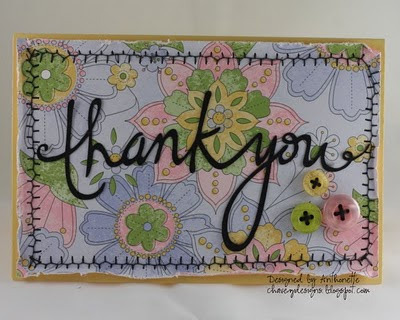 I should've used the sentiment that came with the stamps, but I used a sentiment from Papertrey Ink's Butterfly Dreams set. The Prima rhinestone pearls give my butterflies motion. That's it! Have a good day! Hapy Friday! 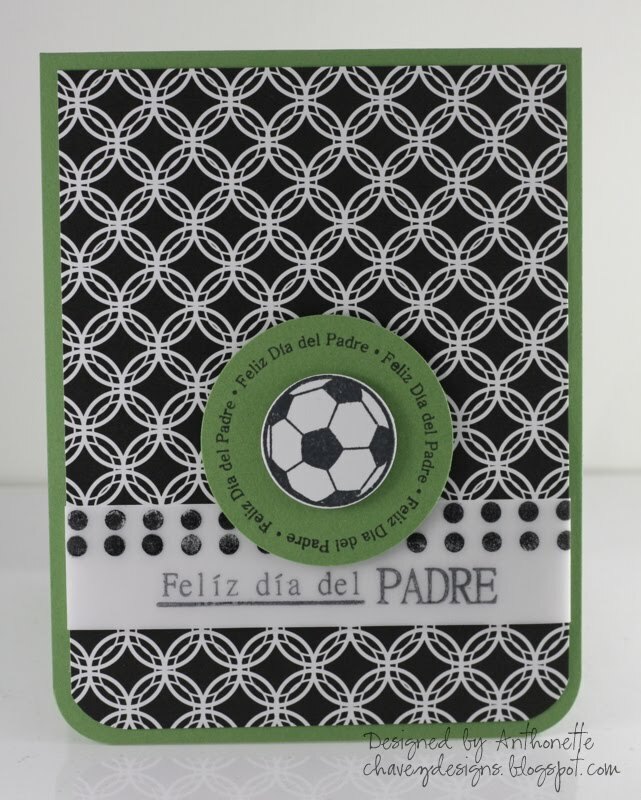 Here's a simple card I made a few weeks ago using Dia del Padre by Dulces Ideas Clear Stamps. The paper is all Stampin' Up. Hi everyone! Here are some tags I designed last month for Angie (one of my favorite front-office people at school). She organized the 80th birthday party for her mom, Phoebe, this past weekend, and needed help with the favor bags. When I found out that Phoebe's birthday was June 12th, I was even more excited about the project. My husband and myself share the same date with Phoebe. I originally designed about 7 or 8 different tags. Phoebe loves purple, so I made sure each tag had some purple. Angie couldn't choose just one design, so she narrowed it down to 3 designs. I'm showing 4 here, because I accidently created a 4th design when I glued the wrong side of the Stampin' Up paper. Duh! The tags are 2 inches in diameter. I created the text in Microsoft Word. After I printed out the text, I used my 2" circle punch to cut out the tags. 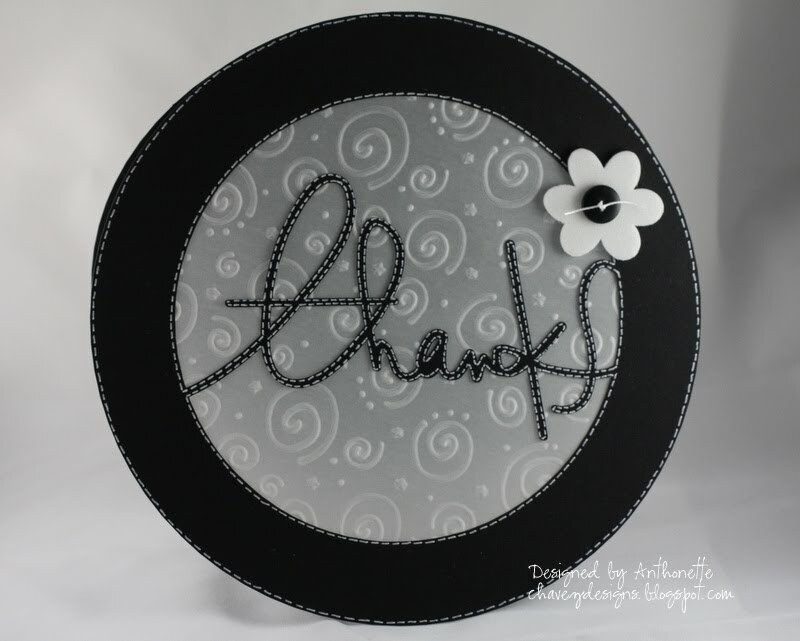 I layered on the Stampin' Up designer series paper and strips of Crushed Curry (or Basic Black) paper. The butterflies and hearts are mounted on the tags with foam tape. I finished off the tags by punching holes with my Crop-a-Dile. Angie didn't need ribbon from me since she bought her own. Tip: If you have this 3 In 1 Classic Butterfly punch, it works well for cutting the small butterfly from Papertrey Ink. This project was fun. Angie gave me a birthday gift before school ended. I got pretty silk flowers and a gift card to Michael's. So sweet! Hola! Today is a special day in our house; my Sweetie and I are celebrating our shared birthday. We didn't plan anything big, since yesterday I was sick. I had a fever for most of the day. The only other symptom was my ears were more clogged than usual (I have seasonal allergies). I woke up fine this morning. It there such a thing as a 1-day flu? Weird. The guys and I had an early dinner and thanks to The Pioneer Woman, I ordered the best mojito! She showed some photos yesterday and I guess I had mojitos on the brain. 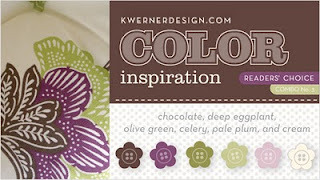 I used the colors from Kristina's Readers' Choice Color Inspiration No. 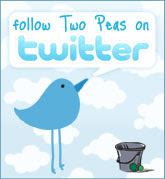 3 to create this card. 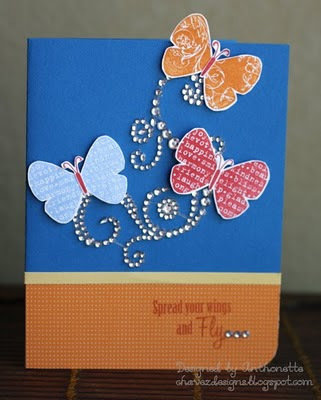 I also drew design inspiration from a card on page 11 of the Stampin' Up Summer Mini Catalog. I made this masculine card and gift card holder for one of the hardest working people at school; our daytime custodian. He is a man of many talents. Anytime we need fruit cut for a fruit platter, he does it so well. He knows how to carve swans out of fruit! I've never tried doing that. Every Monday morning, he cooks a large pot of oatmeal for the staff to enjoy. For the awesome breakfast the school made us volunteers last month, he was the head chef making omelets-to-order. For the Latino Cultural Performance, he was one of the dancers. Any event the PTA organizes, he's there helping us. We couldn't do our job well without him. 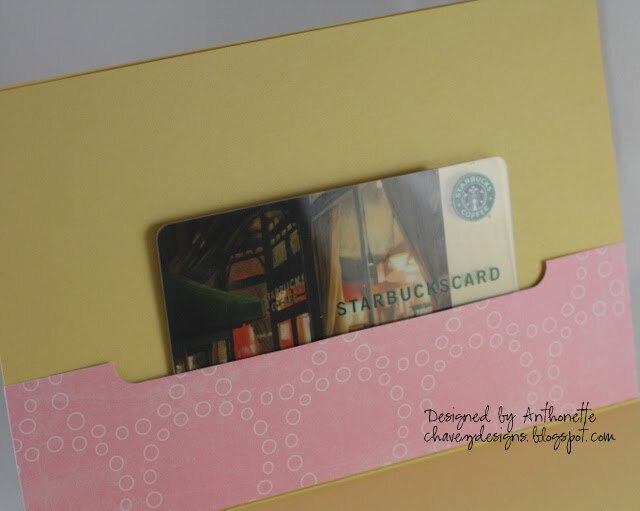 I added a gift card holder to the inside of the card, similar to the one I posted yesterday. I gave him a gift card to Lowe's. Hi my dear paper-crafting friends! Thank you for all the sweet condolence message you sent me regarding my aunt. They were very much appreciated. The circle of life continues. One of our best friends gave birth to a baby girl this morning. Today was K's last day of school. I made this card for his teacher. The "Thank you" was cut with my Silhouette machine. This card is the same basic design of this card from last Fall. 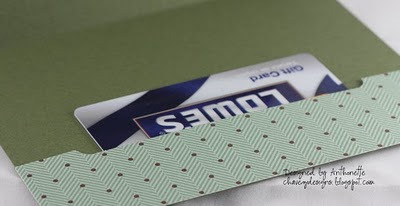 I used my sewing machine to do the stitching on the border. Do you have a Sakura Quickie Glue pen? You should get one. It is perfect for glueing intricate designs. On the upper inside flap of the card, I created a pocket for a gift card. Mrs. A loves Starbucks, so I thought that would be practical gift for her. She is such a nice lady. I really enjoyed helping at school. She also gave me gifts today too; so sweet! Thanks for stopping by. My family and I have been deeply saddened with the passing of my Aunt Christine. She died on Friday morning in Taos, New Mexico after suffering with pneumonia complications due to a long hard-fought battle with breast cancer. Christine was one of my mom's younger sisters and one of my favorite aunts. Here she is over 6 years ago holding Kalino when he was a baby. In her memory, I want to educate as many people as possible on a deadly type of breast cancer that you've probably never heard of called Inflammatory Breast Cancer (IBC). My aunt had been doing yard work, so she thought the soreness in her chest was related to that. She later started feeling pain, swelling, and heat, but it took her a while to actually get it checked out. My aunt was lucky...the Nurse Practitioner she saw immediately suspected it was Inflammatory Breast Cancer. Within a week, she was scheduled for chemo and a radical double mastectomy. Most IBC patients are not so lucky; their cancer gets mis-diagnosed as a breast infection. Here's a YouTube video from a few years ago that talks about IBC. Click here to watch on YouTube. Thanks for reading this! Take care. This thank you card measures almost 8 inches in diameter! I made it large to allow for multiple signatures on the inside. 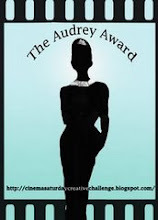 I modified a Silhouette design by Karla Dudley. This is a card to thank everyone at K's school. Yesterday, the staff and students organized a black and white themed reception to thank us for volunteering during the year. They provided childcare for us. We were asked to wear black and white. That's how I choose the color scheme for this card. The reception was awesome! I have to brag. The tea sandwiches were made with dark and white bread. There were cheese and black olives on picks. They served a black bean and sour cream dip with white and blue corn tortillas chips. They served us root beer floats and at each table we had a mini fondue with goodies to dip into the chocolate. There was singing (and dancing performances by both teachers and students. We had heard that some teachers would be dancing. To surprise them, we used the Cricut machine in the volunteer room to make voting paddles "a la Dancing With the Stars". When the teachers took their bows, over a dozen of us held up our paddles with their score. That was fun! A few weeks ago, they also made us the most amazing breakfast: omelets made to order, hash browns, blueberry pancakes, fruits, quiche, coffee cake, and one teacher hand painted on violet flower-shaped cookies. The tables were decorated with Mexican tapestries, vintage wooden art, pottery, and glassware. We are spoiled! I hope your having a great day. I spent my morning in the school library with other volunteers organizing shelves of non-fiction books back into perfect Dewey Decimal order. It was a little harder than I imagined. I'm home to quickly change my clothes to black and white. The teachers, staff, and students at K's school are throwing us a Black & White Reception to thank us for volunteering at school. They are even providing childcare; awesome! Last year, the celebration was amazing too. 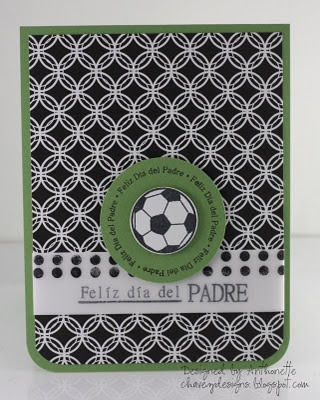 Here is a Father's Day card I made last week for the preview of the Dia del Padre set from Dulces Ideas Clear Stamps. The sentiment is stamped on vellum and then layered on some Papertrey Ink paper. Today is the day; the new bi-lingual stamps for Dulces Ideas Clear Stamps go on sale today! I'm very happy and proud of Paloma. I'd like to introduce you to the latest set, called Vacaciones (or Vacations). All of the Dulces Ideas Clear Stamps are 10.99, plus shipping (such a great value)! This set definitely has me wishing for the end of school. Today, I'm going with the Little Guy's class to the San Francisco Zoo. In all my years living in the Bay Area, I've never been to this particular zoo. I was drawn to the suitcase in this stamp set. Don't we all have that exact piece of luggage? And most of us have it in black! At the airport, it's a little tricky making sure you find your exact piece. I used paper from the Cosmo Cricket Boyfriend line. If you're like me, you are doing laundry at the last minute so you can pack it in your suitcase.